Sun's shinning, businesses are open, residents are finally getting back to normal after Sandy. Luckily the entire region was spared relative to our NYC and NJ neighbors. This time last year, the region was dealing with a freak snow storm. This year is Abby's first halloween. At 11 months, she's a bit young to enjoy a lot of the traditional activities but I gathered a list here in case your family wanted to partake in any Halloween festivities! Eye Spy Halloween Train through the woods at Cabin John Regional Park in Rockville. They also feature Halloween movies and activities. Haunted Train & Creepy Carousel at the Wheaton Regional Park in Wheaton, MD. Be sure to bring a food item to donate. Howl-o-Ween at White Flint Mall in North Bethesda, MD. 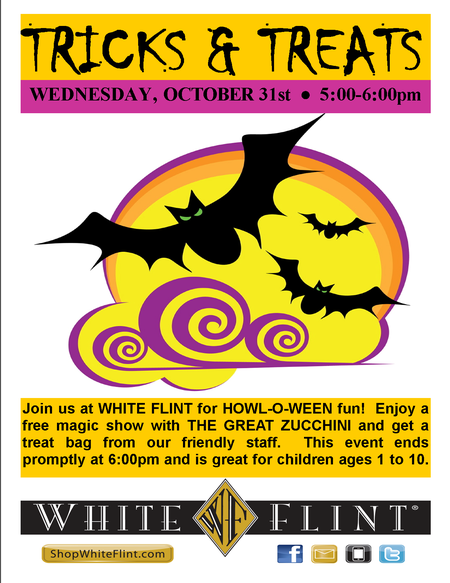 5-6pm enjoy a free magic show with the Great Zucchini and get a treat bag of candy! Tons of other events going on today and through next weekend! The Washington Parent put out this great list of activities for more information.